recessed light fitting for interior use, available in three versions: IP40 fixed recessed light, wired with a PGJ5 20-35W metal halide bulb with my nero finish, excluding power supply unit. IP20 fixed recessed light, wired with GY6.35 12V max 35W halogen bulb with polished chrome, my bianco and my nero finishes, excluding power supply unit (this version is equipped with cylindrical transparent glass for more diffused and decorative light). recessed fix emergency IP40, wired with led 5W 3000K in finish my nero, converter and battery included. IP20 adjustable recessed light, wired with a GU5,3 12V max 50W halogen bulb, or GX10 20/35W metal halide bulb with polished chrome, my bianco and my nero finishes with led source with interchangeable diffusers (24°, 40°, 60°). 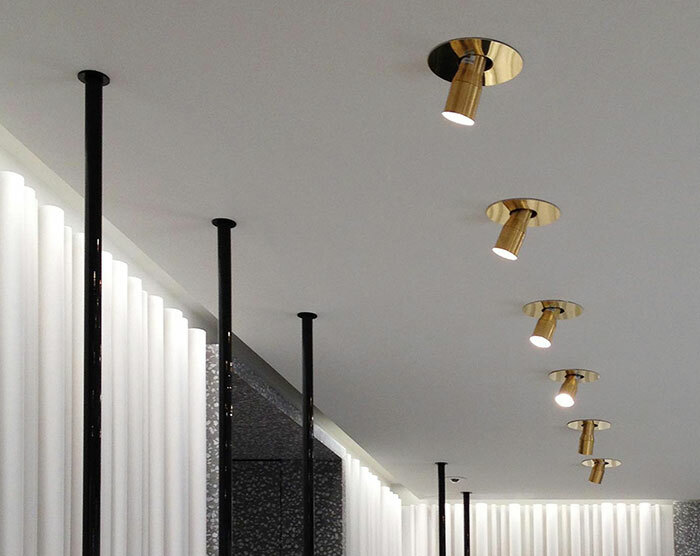 dimensions profile: Each light fitting has a light trap for optimal visual comfort. adapter with power supply unit and transformer included. adjustable through 35° on the vertical axis and by 355° on the horizontal axis (excluding power supply unit and transformer). two cover bezels are available for all versions: a round one (165 mm diameter) and a square one (165mm side), available in polished chrome, my nero and my bianco finishes. dca incasso can be installed in thicknesses ranging from a minimum of 12mm to a maximum of 30mm, thanks to system of adjustable louvers. a fully retractable housing accessory which allows the recessed installation of four light fittings side by side, with the possibility of alternating them with a blank bezel, is also available.